Stunning two part map of Holland. Contado d'Ollanda Parte Settentrionale. - Contado d'Ollanda Parte Meridionale. 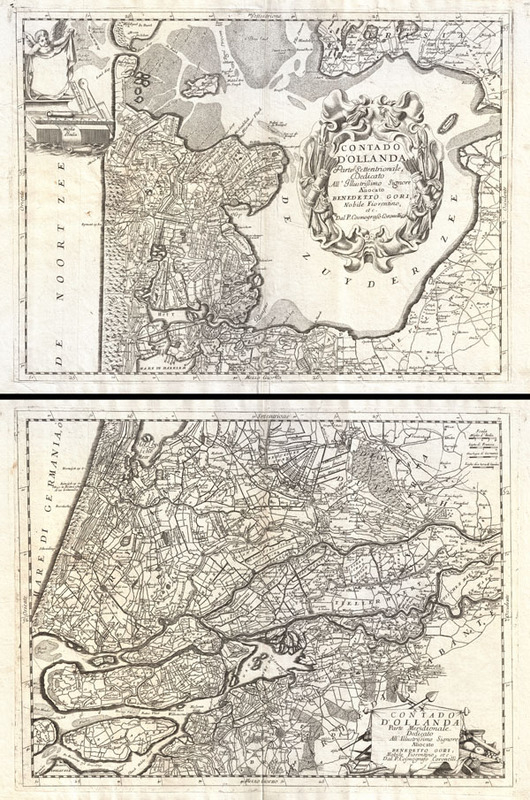 A spectacular example of Coronelli's two part map of Holland or the Netherlands. The upper sheet covers from Friesland to Amsterdam including all of the Zuyder Zee. The southern map covers from the Haarlem Meer south to Breeda and east to Batenborg. Identifies countless cities and towns throughout with larger centers appearing in block form. This map also prominently displays Holland's elaborate canal and irrigation network. Cartographically Coronelli probably drew the material for this map from earlier work by the prominent Dutch cartographers Claes Jansz Visscher or Fredrick de Wit. Each sheet has its own decorative title cartouche, though that of the upper sheet is notably more elaborate being dramatically engraved in the Italian baroque style. The upper sheet additionally boasts a second cartouche in the upper left quadrant that has been left blank - this was most likely intended for a legend that was never completed. Though this map was issued in both Coronelli's 1697 issue of the Atlante Veneto and the 1692 Corso Geográfico, we are able to firmly associate this example with the later due to its blank verso. Coronelli, V. M., Corso Geográfico, 1692. The Atlante Veneto was a Venetian cosmographic atlas issued by the Jesuit Minorite friar, geographer, and globe maker Vincenzo Maria Coronelli. The Atlante Veneto was a massive work consisting of some 13 volumes in four parts. The first section focused on a general introduction to geography and included notes a various geographic systems and globes. The second part consisted of world maps from various periods and in various styles, including double page maps of the continents and poles derived from his earlier globe work. The third part focused on hydrography and included nautically styled maps of important rivers, bays, oceans, lakes, and gulfs. The fourth and final section detailed exploration and describing noting various explorers and their discoveries. The whole consisted of some 191 engraved charts and maps as well as an assortment of views and decorative plates. The atlas was conceived as a continuation of Blaeu's Atlas Major and in many respects follows Blaue cartographically. Many of the other maps are derived from Coronelli's own earlier globe work and exhibit various distinctly globe-like elements. Coronelli first issued the Atlante Veneto in 1691. A second edition was prepared and issued between 1695 and 1697. Most of the individual map plates remain identical between editions. The maps of the Atlante Veneto are universally admired for their exquisite engraving and high production quality, including fine paper and premium inks. All examples were issued uncolored and have typcially been left as such by dealers and collectors. Very good condition. Original centerfold. Pressmark visible. Blank on verso. Blonk, D. and Blonk-van der Wijst, J., Een kartobibliografie van Holland, Hollandia Comitatus, 73.